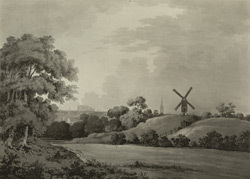 View from outside of the city of Norwich with the silhouette of the cathedral visible above the cityscape. 18th-century Norwich was a centre for wool and silk manufacturing as well as a trading centre for goods coming to Britain from America, the Far East and the East Indies. Daniel Defoe was impressed by Norwich, calling it "an antient, large, rich, and populous city".